Hello! How was everyones weekend/week? My weekend was lovely but this week has ended on a sad note for reasons I'm not going in to. Instead, I will tell you about my weekend that feels about 100 years ago but was in fact only 5 days ago. On Saturday night I had a couple of the girls around for dinner and a movie, with air con - praise the air con! I was umm-ing and ahh-ing if I should cook because it was so damn hot and I had no inspiration. All I could think about was cold things. Knowing one of my lovely ladies was slightly shady from the night before, salad was out of the question and carbs were most definitely in. I was tossing up between trying a new Japanese dish I've wanted to give a go for a while and doing something I've made a few times already. After a quick group chat it was decided, Italian not Japanese. I made the Green Chicken Meatballs I've made before and served them with a rich tomato based pasta sauce and spaghetti. I feel I should have made a brighter more summery tomato sauce for the chicken balls but I over splashed the wine and used red wine instead of white because thats what I had on hand so I needed to cook it down more. White wine is now on my shopping list. I was definitely not baking dessert with the heat which meant no cake or pie or crumble because that meant turning on the oven. Instead, I scoured Alison Roman's cookbook 'Dining In' for inspiration. I've owned her cookbook for a few months now but haven't made a thing from it. I seem to pick it up, oooo over all the recipes and then realise I'm missing an ingredient and the book goes back on the shelf. It's got some delicious looking recipes to share and make with friends, and it's definitely got a summery feel to it, no heavy wintery stews like her current NY Times recipe that's gone viral. This time I did not put the book back on the shelf without making something. Frozen Blackberries with Labne and Honey and OMG it's delicious. I used frozen raspberries instead of fresh blackberries and greek yoghurt instead of the labne but she says you can use both those in her recipe anyway - just doesn't match the name. 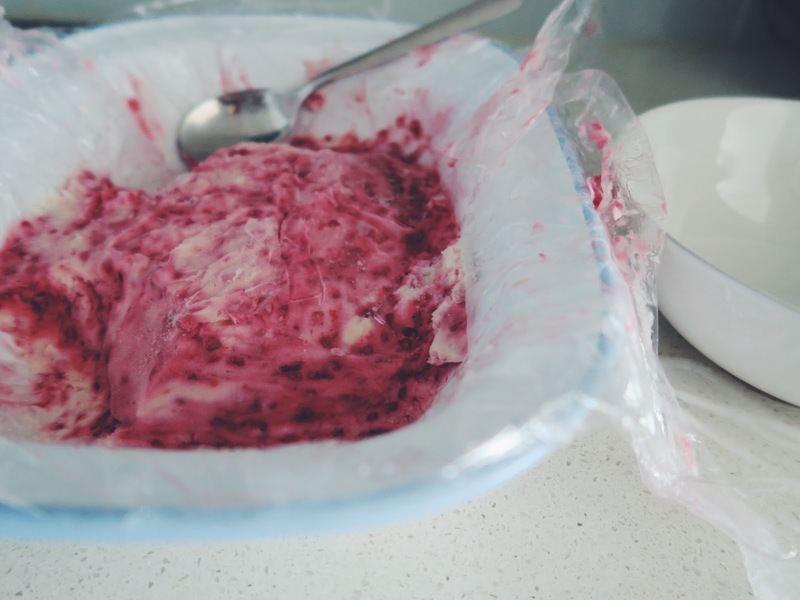 It's a yoghurt based ice cream or parfait like dessert that you don't need an ice cream maker for, just a pot, a whisk, a bowl and a freezer. You also don't need to make it days in advance, just 2-3 hours is enough, but you can if you need to. It was exactly what dessert should be on a hot summers night. Tart from the greek yoghurt and berries but also sweet and creamy from the honey and yoghurt but best of all, cooling. My photos do NOT do it justice at all! I forgot to take any photos on the night and these photo's are of the leftovers which look a little icy from not being left out to soften slightly. I'm planning on making another batch for my freezer this week as the leftovers from Saturday were eaten up when I took it to my Wednesday night date. It's too good not to have some ready to go at all times this summer. Sunday was shopping. Bridesmaid dress shopping that is!! I went with the bride-to-be and fellow bridesmaids to the City, slipping and squishing in and out of dresses for most of the day. Nothing was decided but there are now potential yes's and definite no's. Oh and for lunch I had my first Bao Bun, I ordered a BBQ Chicken one - holy smokes they are delicious! I've never eaten one before but see them everywhere at the moment on menus. They are my new obsession and I want more, it was so so tasty, I can't stop thinking about it. Do you have a good recipe for a bao bun? How was your weekend/week? Any plans for this one other than survive the heat wave? Stay cool and safe lovely people! Spray a 9 x 4 inch loaf pan with oil (or rub a little around the tin with paper towel) then line it with cling wrap. The oil is to help the cling wrap stick to the tin. Cook the fruit and 1/4 cup honey (and lemon juice, if using) in a small pan over medium-high heat until the berries have started to break down and the liquid has thickened, about 8 - 10 minutes. (Simmering the berries quickly will reduce and thicken the liquid while keeping many of the berries somewhat intact, which is what you want ). Remove the pan from the heat and let cool completely. Place the mixture in the fridge if you want to speed up the process. 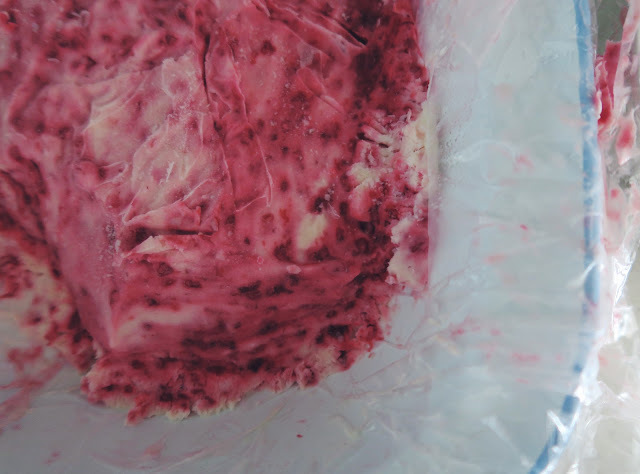 Once cooled, the berries should have the texture of a loose, spreadable (not pourable) jam. In a large bowl, whip the cream by either using an electric mixer or a good old fashioned whisk until the cream is at medium stiff peaks. Cloud-like, no mountains. Fold in the greek yoghurt (or labne), the remaining 1/2 cup honey and the salt until just combined. Add the cooled berry mixture and using a spatular or large spoon, just fold it in (3 or 4 times, max) so you have large streaks of berry mix and creamy yoghurt mix. Pour mixture into the prepared tin and smoothing over the top. Place the loaf tin in the freezer until it's firmed up, about 2-3 hours. This is best served around the 2-3 hour mark so the texture isn't too soft and not too hard. If you are making this in advance, let it sit in the fridge for 10-15 minutes or so to soften up. A perfect sweet treat for the hot summer days! It's fun to find another 20-something food blogger out there :) This looks like a wonderful dessert for a hot day, I'll have to remember it come summer here. We're having quite the opposite weather where I am and hot weather sounds like a treat!